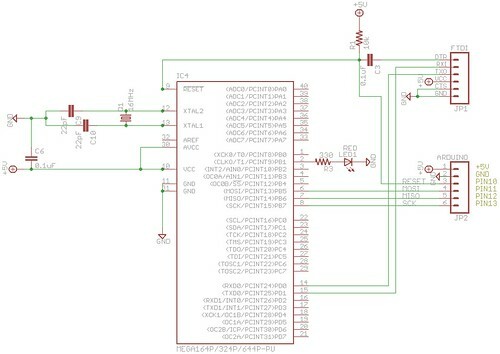 Could I use my JTAGICE that has a ISP 6pin connector to program a bootloader into a ATMega1284p? Would I use the Aduino IDE or AVR Studio 4.18? How does this chip fair as an Arduino say with the SPI system for the W5100 ethernet controller. I ordered a few of these from Mouser. I also have a STK500 also I could use with a 16Mhz crystal too. I don't know what is involved with using JTAGICE to program via ISP. This came up in another thread recenly, outlook was not good. Its an 8-bit AVR, so would fair as well as the others for W5100 ethernet controller. What FTDI are you using? Also, it is possible you have the RX and TX swapped. It will not hurt anything to try swapping those leads. Well after spending most of my time sorting out the arrangements following a bereavement in the family I have been able to spend a few hours trying to get the 1284P to talk with the PC and upload a program. But to no avail. Just to prove that the FTI breakout board was working fine, I breadboarded the 328P chip I received off e-bay, and could upload the blink and fade exampled with no issue. Breadboarded the 1284P and hooked up the FTI board - no matter what board I select from the dropdown option I get the attached error. have the Rx,Tx pins swapped as shown in your schematic, if using a regular FTDI cable or FTDI Friend. For the sparkfun board, you just have to be certain the signals flow in the correct directions. I always use 1K resistors in Rx,Tx lines in case of mistaken cross-wiring. Having investigated this a bit, it seems that the problem is because the Optiboot loader resets the ATMega328 when the serial port is opened. When avrdude is started up to program the slave chip it firsts opens the serial port then tries immediately to write to it. The initial comms fail because the chip has reset and, whilst in the bootloader, isn't actually responding to the STK500 protocol. Can you connect a LED and resistor to chip pin 19? It want is used for Arduino pin 13. It will blink a couple of times when the chip is powered to show that the bootloader is working. Also, you will see the LED go out when reset is pressed. the Arduino IDE in all versions. I too have no idea what is happening. When the 328P is breadboarded, with DTR connected to the reset via a 0.1uF capacitor in series and a 10K pull up resistor I can select the Uno as the board in the IDE and it uploads many of the example sketches. 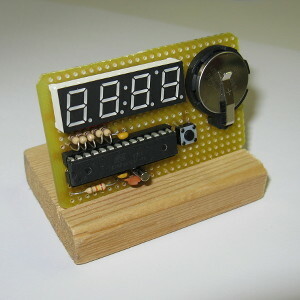 With the 1284P chip breadboarded in the same way it fails with the errors shown. When a successful upload on the 328P is achieved, the TX and RX leds on the FTI board initially flash a few times, pause and then flash for a longer period. It's as if the software is initially checking for the chip, the chip identifies itself and agrees to accept the code, which is then transmitted. When breadboarding the 1284P I get the initial flashes on the TX / RX leds on the FTI, but then the IDE pauses before the time out results in the errors. I'm no expert, but it seems to me as if the bootloader is communicating correctly. I've tried different baud rates, but with the normal standard port settings.. I assume the optiboot loader uses the standard serial protocols ? During the last days I did a lot of tests trying to solve the problem mentioned here. If you're using the Mighty-1284p files by maniacbug, select the board "Mighty 1284p 16 MHz w/Optiboot" then put a 220K resistor in series on the line beetween the FT232 TX and the 1284p RX0 pins. If you're using the "Original Mighty 1284p" board, then you could try with a 120K R. Or, maybe, without components. Leo, thanks for the reply... I don't have any 220K, but tried with 100K and still no joy. I've looked through that thread and noted some comments of the baud rate, so checked the boards.txt file and noted that it stated 115200, so I tried this and again got the same sync error. I know the FTI board is working fine as I can program the 328P with no issue (no serial resistors required, and even with the port set to this fast speed). I'm finding all this very frustrating. Programming PICs using PicBASIC now seem a lot easier compared to using larger processors other than the original arduino based 328P. I used to wonder why so many projects on the web had "shields" stacked one on top of another and then the lot placed into a box rather than the traditional breadboard and then dedicated PCB (be that stripboard or printed) approach. Having spend all this time fuffing about with the 1284P I can now see why ! One last question... having got the 328P running on the breadboard, is it possible to use that to program the 1284p via ISC using MOSI / MISO / SCK pins or do I need a dedicated programmer for that ? chip yourself, but have been assuming the chip you bought has a proper bootloader burned into it. who've bought things on ebay. Alternatively, scrub this mission, and just buy a 1284 board from Crossroads.